Popular television host and minister, Andrew Wommack shares sixteen of his best teachings in this powerful new book. Teachings include sections from some of his most popular titles: Better Way To Pray, God Wants You Well, The War is Over, Believer's Authority, Spirit Soul & Body, You've Already Got It, The True Nature of God, The Holy Spirit, True Christianity, Hardness of Heart, The Effects of Praise, Grace: The Power of the Gospel, Harnessing Your Emotions, Staying Full of God, and more. 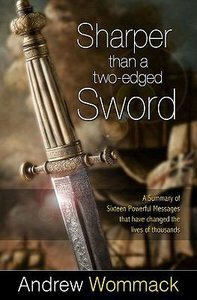 About "Sharper Than a Two-Edged Sword"